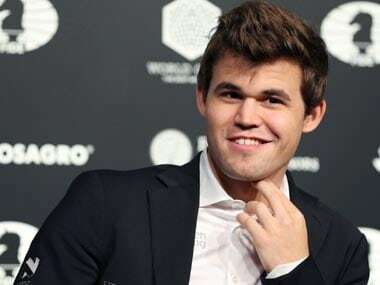 Wijk Aan Zee: Multiple world champion Viswanathan Anand played out an easy draw with Sergey Karjakin of Russia while B Adhiban lost to top seed Magnus Carlsen in the second round of 80th Tata Steel Masters Chess tournament. On what turned out to be an easy day, Anand had to stretch himself only a little as Karjakin did not attempt any complicated warfare. The result was exchanging of pieces at regular intervals and the players signed peace in an opposite coloured Bishops endgame. With 1.5 points in his kitty, Anand now shares the second spot behind Anish Giri of Holland who came up with another sterling performance to beat Vladimir Kramnik of Russia. Norway's Carlsen, Shakhriyar Mamedyarov of Azerbaijan and Anand are now sharing the second spot. Playing white, B Adhiban paid a heavy price for his safe approach against Carlsen. Known for his combative and uncompromising chess that won him many fans in the last edition, Adhiban went for a sedate four knights Scotch opening and it never looked like he was in serious contention. The middle game witnessed the trading of queens and the ensuing endgame was a likely draw. 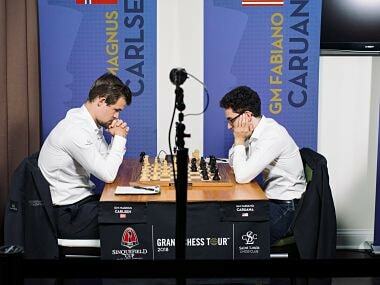 However, as it normally happens to Carlsen's opponents in such positions, the world's top ranked player just pressed and Adhiban could not find the right path to equality. In the end, two passed pawns rolled down white's throat and it was all over. 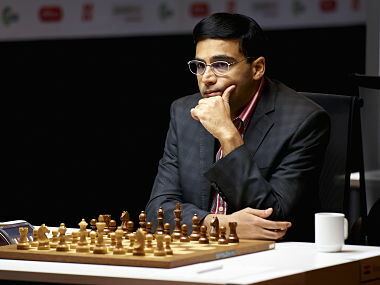 The day however belonged to Anish Giri who scored his first ever victory over Kramnik in a Classical game. Wild complexities right from the early middle game led to tactical possibilities from both sides and Giri was a step ahead of Kramnik for once. In the challengers section being organised simultaneously, Vidit Gujrathi scored a crushing victory over Michal Krasenkow of Poland. Playing the white side of a Sicilian defense, the Indian Grandmaster was in full swing as he launched an early attack on the black king. Seizing space inch by inch, Gujrathi paralysed black's position completely pretty quickly and Krasenkow decided to call it a day after a mere 27 moves. The other Indian in the challengers, D Harika got her second good result on the trot as she held higher ranked Dutchman Benjamin Bok to a draw. Jorden Van Foreest of Holland, Dmitry Gordievsky of Russia, and Anton Korobov of Ukraine share the lead with Gujrathi on 1,5 points apiece after the end of the second round in this section. Benjamin Bok (Ned, 1) drew with D Harika (Ind, 1); Erwin L'Ami (Ned, 1) drew with Amin Baseem (Egy, 1); Vidit, Santosh Gujrathi (Ind, 1.5) beat Michal Krasenkow (Pol, 0.5); Lucas Van Foreest (Ned, 1) beat Aryan Tari (Nor, 1); Dmitry Gordievsky (Rus, 1.5) drew with Jorden Van Foreest (Ned, 1.5); Matthias Bluebaum (Ger, 0) lost to Olga Girya (Rus, 1); Jeffery Xiong (Usa, 1) drew with Anton Korobov (Ukr, 1.5).